We head through the Painted Desert towards Flagstaff. The doom laden chords of The Doors seep out into the emptiness, leading on into Riders on the Storm. Ponderosa pines sprout from the arid hills and the city limits loom out of a mirage. The Cadillac heads downtown and touches tyres on Route 66. We’re on America’s main street, we’re on the Mother Road. The town centre ranges along the railway where impossibly long trains regularly thunder through. There’s a bar and restaurant across the tracks which does a special free cocktail when the train is passing, if the waiters can hear you, I suppose. Our motel is a half mile out of town, just the right side of seedy but with a good pool and Route 66 visible from the window. There’s a Barnes and Noble next door where we spend some time reading and drinking buckets of coffee. Walking back into town the neighbourhood is a homely patchwork of residential, bohemian bars and diners, with a colourful smattering of churches, from Protestant sects to a determinedly Catholic Our Lady of Guadaloupe. Davin spends a lot of the afternoon in a music shop with Oran and buys an effects box for his guitar. The car is filling up with stuff, but what better place than Route 66 to buy your wah-wah pedal? We relax over a beer at a shaded sidewalk bar. This is the only time I have ever seen a waitress accompanied by an intern – they’re very thorough here. Flagstaff is a lively spot, its redbrick streets typical of the American west but with a more sophisticated, bigtown feel than Durango. At the town centre square there’s hot southern rock with a country twang playing throughout the day and into the evening. A large screen shows Happy Feet and there is indeed a happy feeling pervading the town. After sundown, the nearby Lowell Observatory has set up a few telescopes for public amusement and edification in the square. We take our turn and talk to the astronomer who, as it turns out, is from Dublin. Small world, big universe, same sky all over. After an evening meal at the railway track, we take the windy road to the hills where the Lowell Observatory perches above the town. It’s a picture book observatory, a serene and surreal dotting of buildings set in the forest. There’s a great display of stars above us while beneath the diamond lights of Flagstaff spread out along Route 66. Again, astronomers have set out their stalls and we queue for a peek at the planets. Percival Lowell obsessed over the sky, and there’s plenty of sky over Flagstaff. It was Lowell who put canals on Mars but also put a planet out beyond Neptune. Not long after he died this last planet was finally discovered, appropriately at Flagstaff. Pluto’s first two letters a tribute to the astronomer. The Grand Canyon is due north of Flagstaff. We set off early through the San Francisco Peaks. The Ponderosa forest passes changelessly by. These trees are peculiarly regular. Neither dense nor inspiringly huge, they conspire to a misleading ordinariness, though the overall effect is unsettlingly vast. The Canyon is easy to find. Keep going till you hit the hole in the ground. It takes some time to locate our accommodation, the Maswik Lodge, inside the park. We’re too early to check in and a bit hot and bothered by it all. I’m anxious to see the canyon as though it will somehow close or diminish if allowed to stay unobserved for another hour or two. Eventually we trudge down to the rim. The initial view is perplexing. Like much of America it triggers a sensation of deja vu, but such deja vu is based on the image and the reality itself is so enormous that it becomes difficult to recognise. At the canyon’s most popular viewing point the whole thing is flattened to hues of blue and magenta, presenting a tableau that is impossible to assimilate at once. It’s when we move around in the landscape an appreciation of its immensity and beauty begins to seep in. 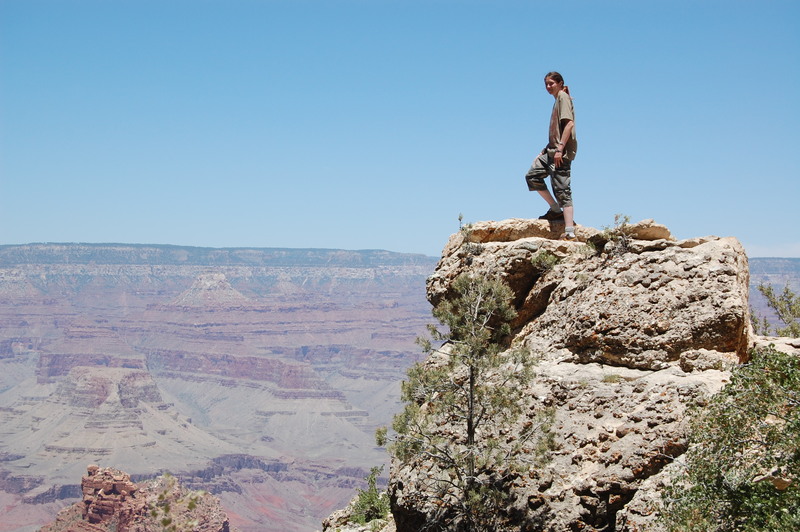 We venture just below the rim on the first day and teeter over the abyss on unprotected trails. A friendly squirrel pulls Davin’s hair and poses for the camera. The park at the south rim is spread over several miles. A free shuttle service links the various vantage points. This is just as well. At one point we decide to walk between two stops but away from the shade of the pines it is very hot. The walk along the rim is a joy. There are a number of lodges teetering on the brink dealing in arts, crafts and souvenirs. Park rangers wait politely to help tourists with enquiries and to share their knowledge of the park’s wildlife and history. Californian condors wheel far below, tiny even through the binoculars, and they are big birds. We take our first dip below the rim and the heat gathers ever closer. The boys are particularly taken with capturing all this on camera and pose appropriately above yawning chasms, all this without a safety net, or even a railings. Sunset at the canyon is worth the price of admission. This spectacle has been specially adopted by the God crew. Our original perch was pleasantly quiet, I thought, but herself moves us two hundred yards further on to where a battalion of Jesus fans are praising the Lord with the encouragement of their pep-talking leader. Well, they do have a point. If this is God’s light show it’s the best goddamned lightshow on the planet. A resident of the park also gives strangers turns at his telescope and answers any questions. This is a thing that Americans like to do. Courtesy is by way of duty but not in any weary sense, they’re proud of this place and like showing it off. The next morning we brave the chill of dawn to catch the sun coming up. We head westward to get a good vantage point, practically sprinting up the path so that we’re winded by the time we get to a good spot. Already we can spot hikers making for the bottom of the canyon. It is reckoned as next to impossible to get up and down in a day, and even to get down requires an early start. It looks a great adventure, setting off with a small pack, the odd lonely light shining from lodges on the rim. Later, we take a shuttle east for a brief adventure below the rim. Myself and the boys plunge towards the towering desert. At seven thousand feet there is no sense of coolness, falling a few hundred feet in the next half hour is parching. Herself, meanwhile, relaxes by reading horror stories helpfully posted by the park authorities, telling how hikers have managed to do themselves to death by underestimating the power of the landscape. Things aren’t helped by a family foursome, whom we passed as they ascended, clearly noting our casual footwear and the boys’ black teeshirts. They ponder loudly at the top on whether they should call the rescue services given that such an ill-equipped a party as us couldn’t hope to make it out alive. We do, of course, the boys bounding up to the rim while I manage to plod home by myself. We stop for drinks at El Tovar – the hotel for the top brass which successfully mingles elegance with rustic wilderness charm. The waiter from West Virginia cheerfully tells me I’m like Mick Jagger, but without the wrinkles. I laugh, causing more wrinkles, and get myself upgraded to Pierce Brosnan. “Why Pierce was here just last month, sitting right over there at the bar.” Small world. We return for our evening meal, although there’s a long queue. But it’s worth it to upgrade from the Maswik canteen to a proper restaurant within sight of the rim. A restaurant on the edge of the universe – in a way.